A blog is a type of website. The word blog was coined from the word web log. Blog can also be used as a verb, meaning to maintain or add content to a blog. 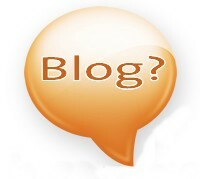 Blogs are usually maintained by an individual referred to as the “Blogger”. A blog contains regular entries of commentary. Most blogs are themed to a specific topic. The Blogger has a running account, in the form of an online journal of their thoughts and opinions of a particular subject. Bloggers write in an informal and personal manner. Most blogs are interactive. It allows and encourages readers of the blog to leave comments, share opinions and discuss the topic further. The topic of your blog is whatever you want it to be. There are millions of them, in all shapes and sizes, and there are no real rules. Your blog can be your personal diary of your thoughts and opinion on a topic, a daily sermon, a collaborative space, a political soapbox or even a breaking-news outlet and your own memos to the world. If you are looking into having your Wordpress blog built, go here for details of our website building services. Click here to for details on our "Blogging & Blog Marketing Training Course".